North Cyprus is a great city to be visited indeed. You can make your trip a gratifying one by boarding in the Dorana Hotel. 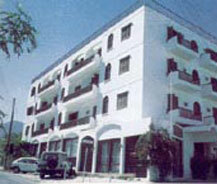 Dorana Hotel is located at the Kyrenia City. It is about 44 km away from the airport and it is placed near the famous place of Kyrenia. It is comparatively a big hotel with 30 rooms comprising of three, two and single bed rooms. All rooms have centralized heating and cooling systems and also rooms are serviced with satellite tv, 24 hour wireless internet connection. Also, Dorana Hotel has a big lobby at the entrance which has open Satellite TV for visitors along with a music system. There is a 24 hour restaurant which provides all kind of delicious dishes. The lobby has a separate hot and cold drinks bar. The hotel authorities provide buses to beach and nearby tourist spots absolutely free of cost. Online booking option is available aswell. When compared to boarding charges of other hotels Dorana Hotel's charges are less. North Cyprus is the perfect holiday destination and Dorana Hotel can be a choice where you need to stay to have an affordable trip there.